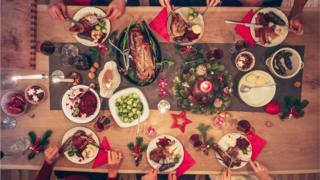 From boxes of chocolates to mince pies and even Brussels sprouts, Christmas wouldn't be Christmas without a table piled high with food. But the price of the festive grocery shop has spiralled this year, thanks to growing food inflation. Food and soft drink prices rose by 4.1% in the year to October - the biggest growth in four years and a move that's hit some perennial Christmas favourites particularly hard. The average price of smoked salmon shot up by 22.9% between November 2015 and November 2016, according to Kantar Worldpanel. Brussels sprouts are up 8.4%, while Christmas puddings are 7.7% more expensive, according to the figures. In September and October, consumer price inflation hit 3% compared with a year earlier - the highest level in five years and 0.9% above the rate of wage growth. But some of the key components of Christmas - including popular presents such as smartphones and clothes - have seen average prices rise by far more than that. So what's behind the increases? And are we tightening our belts this Christmas as a result? The pound has fallen by as much as 20% relative to other currencies following the Brexit vote in 2016, meaning that retailers who rely on imports have seen significant price rises. The UK brings in about 50% of the food we eat from overseas, so supermarkets have been under particular pressure. Paul Martin, head of retail at KPMG, says that consumers are particularly sensitive to food price changes. "Before 2017, grocery prices were falling off the back of the supermarket price war," he says. "We have gone quickly from a position where people are used to their weekly shop getting cheaper to getting more expensive." Mr Martin points out that the effect is psychological, with people paying more attention to rising prices than falling ones. "Some sectors are hit particularly hard. For example, the price of smoked salmon has gone up markedly and that is an important part of Christmas for many people," he adds. Although some foods have become more expensive, we are buying it in increasing quantities. Over the three months to November, total food sales increased 4%, according to the British Retail Consortium and KPMG. And it seems we are still keen to treat ourselves as Christmas approaches, but are being more innovative in how we shop. One in three shoppers say the cost of Christmas is a growing concern compared with last year, says grocery research firm IGD. About 45% of shoppers told the IGD they would start Christmas shopping early to spread the cost, compared with 35% who said the same last year. And 43% are planning to spread the bulk of their food shopping across a range of stores - twice as many as were planning to do a big Christmas shop in one place. Many tech enthusiasts will be hoping for an iPhone X in their Christmas stocking. But they could be left disappointed if the price hikes seen on smartphones make them an unappealing purchase. The cost of premium smartphones has been rising steadily each year. Average prices increased by 10.2% in 2015, 16.7% last year and 6.7% in 2017, according to technology analysts Gartner. PC price hikes have been even more pronounced, with the average selling price rising by 23% in 2016 and 14% in 2017 - after an average fall of 29% in 2014. Technology prices largely fell by 3-5% every year until 2012, but now things are different, says Ranjit Atwal, a research director at Gartner. "On the PC side, a lot of people started to buy better models that were higher spec, so started to move up the price curve," he says. "Then there are issues around exchange rates. When the pound fell in 2016 we saw quite a big increase in pricing. The cost of the components has been increasing too." Will this strike tech gifts off Christmas lists? Phone users are typically holding on to their handsets for four or five months longer, as prices have become more expensive, Dixons Carphone's chief executive Seb James warned back in August. But Mr Atwal says shoppers aren't overly bothered by price hikes. "Smartphones are much more pervasive - everybody has one," he says. "People don't buy them all in one go, so they don't really realise. Groceries are a frequent purchase: if the price of milk goes up 5p, you notice that." Prices have gone up 11.5% in the UK online clothing, shoes and accessories market from November 2016 to November 2017 on a like-for-like retailer basis, says data analytics platform WGSN Instock. WGSN's Nivindya Sharma notes that retailers have had to grapple with increased sourcing costs as the pound lost value after the Brexit referendum. Incorporating this year's trends such as ruffles, embellishments and embroidery in designs has also pushed prices up, while the fashion for upmarket trainers has given retailers a boost. "There is an increasing propensity among shoppers to buy less, buy better," she says. "As a reaction to this, retailers have invested in expanding or introducing their premium collections and price points. There is also a greater volume of premium wool products such as merino and cashmere now available on the High Street. "Shoppers are increasingly concerned about value for money, so retailers have had to really justify their price points through initiatives such as design innovation, quality, premium fabric or high-profile collaborations." Shops have also learnt from last year's mistake of discounting clothing too early. The mild winter weather of last year meant shops had to slash the price of coats and jackets. This year, they waited until the temperature started to drop significantly, making shoppers more willing to pay full price. As a result, women's coat prices online have gone up 6.8% year on year, while women's jacket prices have gone up 9.9%.